How to navigate the city and find our school in Edinburgh? Getting to Edinburgh and inlingua is easy, no matter where you are coming from or how you choose to travel. 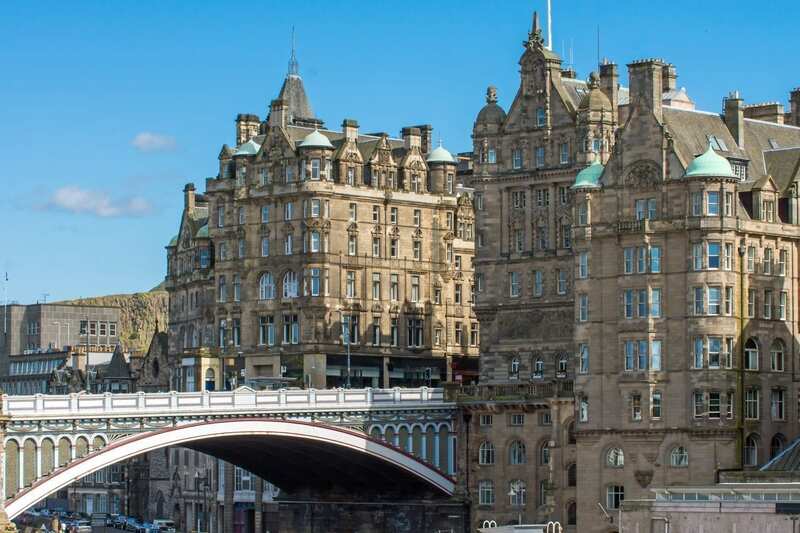 On this article you’ll find general information about how to get to the city of Edinburgh, and details of how to navigate the city and find your inlingua school. Edinburgh International Airport receives daily flights from more than 20 UK and 40 European airports, as well as daily transatlantic flights. Flights from international destinations are also scheduled throughout the week. The airport is about 12km from the city centre. The 30-minute journey can be easily made using the frequent airport bus or tram services, or by taxi. Edinburgh has excellent rail links throughout the UK. The East Coast mainline, which links Edinburgh and London King’s Cross, is the UK’s fastest intercity railway: you can travel between the cities in around 4 hours. Or, if you prefer to travel overnight, a sleeper service runs between London Euston and Edinburgh Waverley 6 nights a week. There are great links to other cities too. The journey to Glasgow only takes 45 minutes, while York, Newcastle, Inverness or Aberdeen can be reached in about 2 hours. All trains arrive at Waverley Station in the centre of the city, although some trains also stop at Haymarket, which is a smaller station in the West End. If you are travelling on a budget, buses are often your best bet. Edinburgh is well placed on the Scottish motorway network so getting here is easy with regular bus services from all major UK cities. Buses and coaches arrive at St Andrews Square bus station in Edinburgh’s city centre. Travel times by road are less than you might think. From the south: Birmingham is about 5 hours away; Manchester and York, 3 hours; Newcastle, 2 hours. From the north: Inverness is about 3 hours away; Aberdeen, 2 hours. Route information for drivers can be found on the RAC or AA websites. Edinburgh is a compact city and is easy to get around on foot, by bike or by public transport. 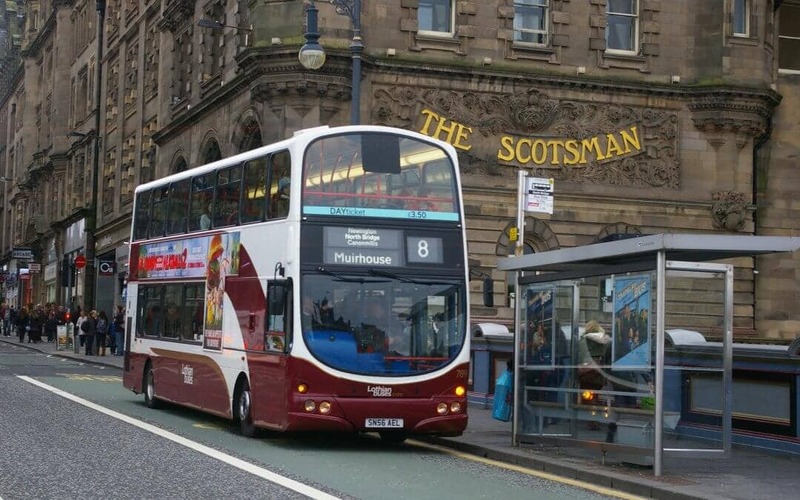 Edinburgh and its surrounding suburbs are well served by two local bus companies. A tram service also operates in the city centre. The main public transport used in Edinburgh is the bus. You will see the famous double-decker buses everywhere. Ideal for infrequent users. SINGLEtickets are available from your bus driver. When boarding the bus let the driver know the type of ticket you require and then place the correct change into the red fares box. Please have your correct fare ready as our drivers do not have access to cash and cannot give change. A day ticket is perfect if you wish to take the bus several times a day. With this option, you have access to all buses in Edinburgh for one day and you can of course use them as often as you’d like to. The day ticket costs £4.00 and you can buy it directly to the first bus driver also. It is the best option for regular travellers. You can choose from a one-week card and a four-week card. With the Ridacard you will have unlimited travel on bus and tram, day and night. The Ridacard has to be purchased to one of the Travelshops from the Lothian buses (situated on Hanover Street, E London Street or on Market Street). We are based at 40 Shandwick Place, Edinburgh, EH2 4RT, United Kingdom.